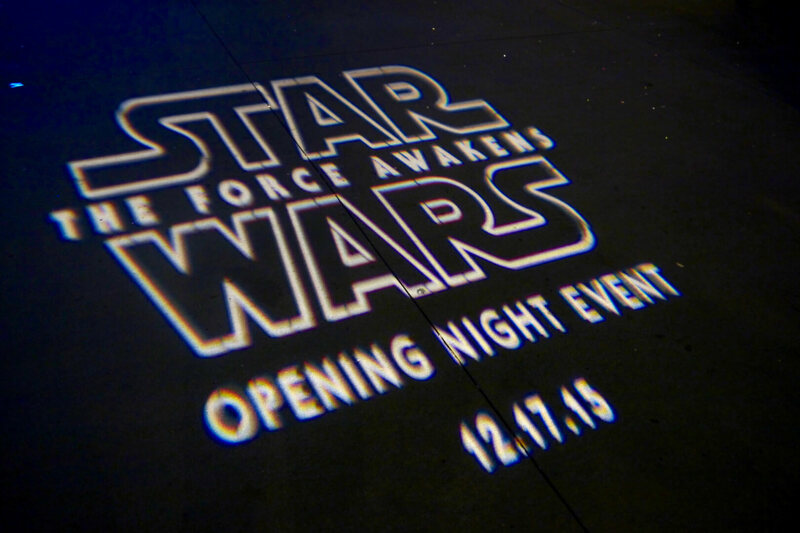 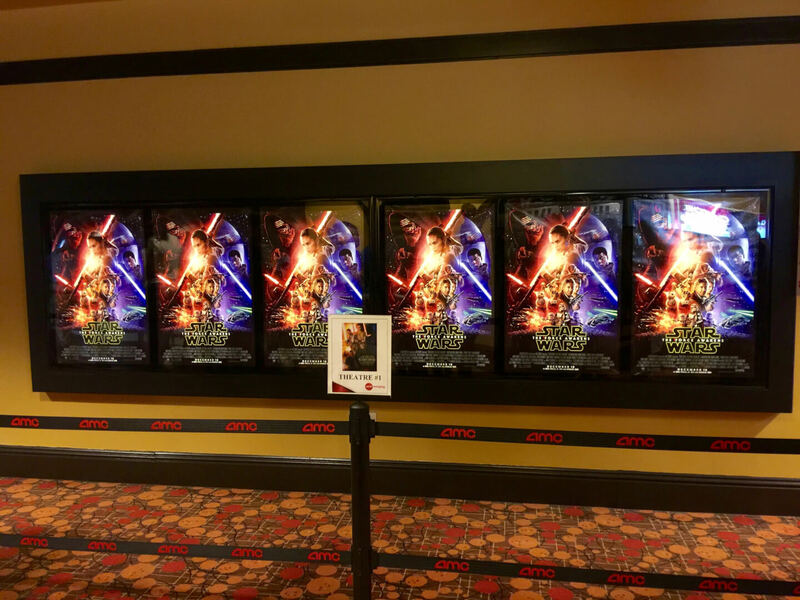 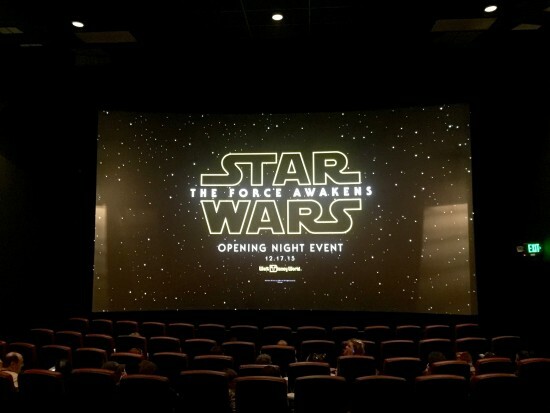 Once the official full trailer for “Star Wars: The Force Awakens” was shown on Monday Night Football back in October, advance movie tickets for the highly anticipated film went on sale at theaters across the country. 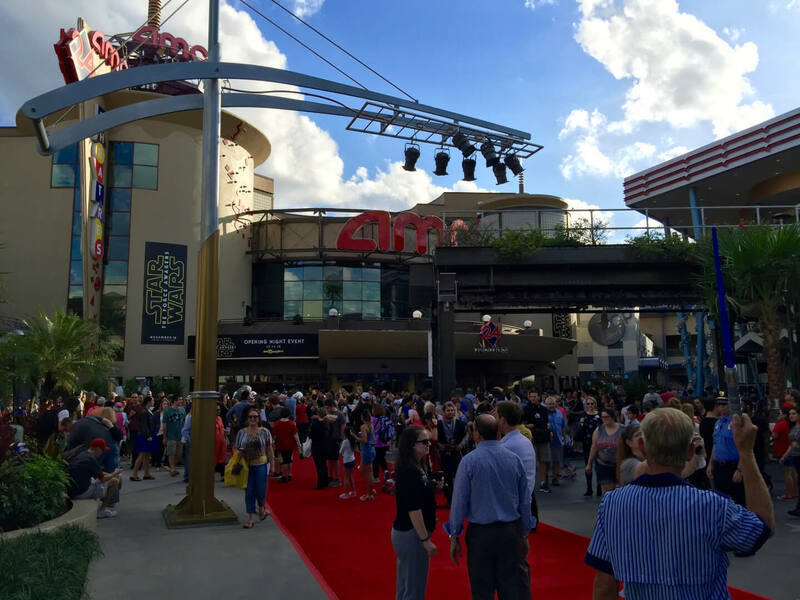 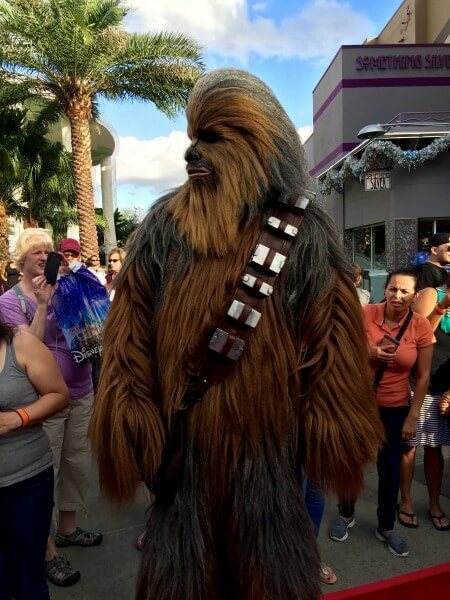 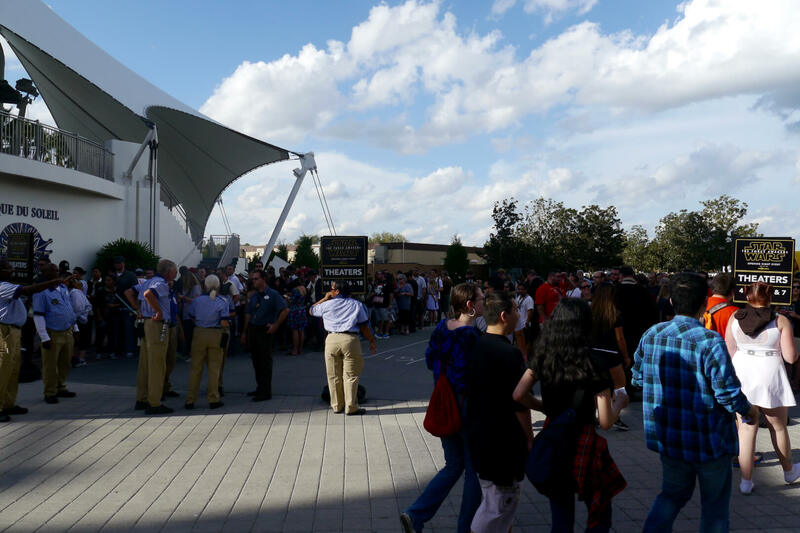 The hottest ticket by far was a coveted spot at the AMC Disney Springs 24 theater for the Opening Night Event, which included a party after the movie at Disney’s Hollywood Studios. 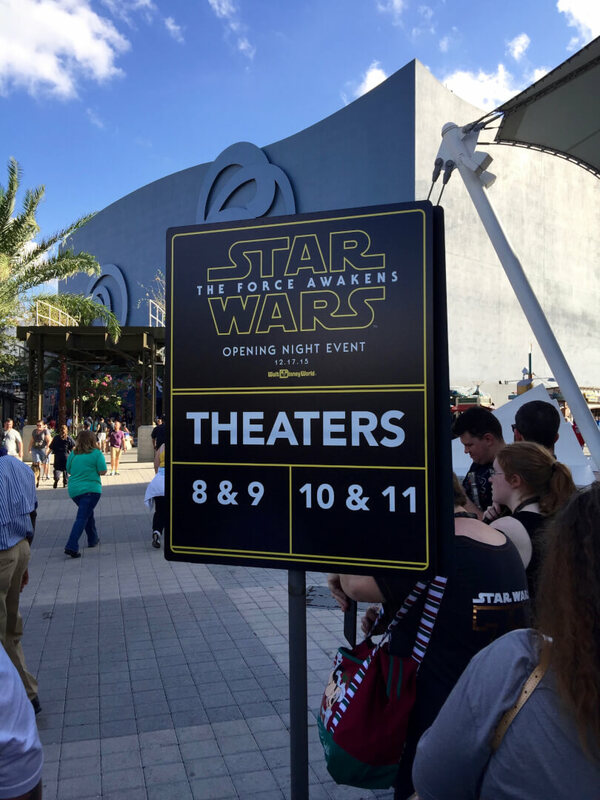 At Disney Springs, ticket holders waited in line starting at 8:00am to check in and pick up their lanyard and movie ticket, as well as other assorted goodies including a BB-8 pin, to reserve a spot for several lines reserved for each theater playing the movie. 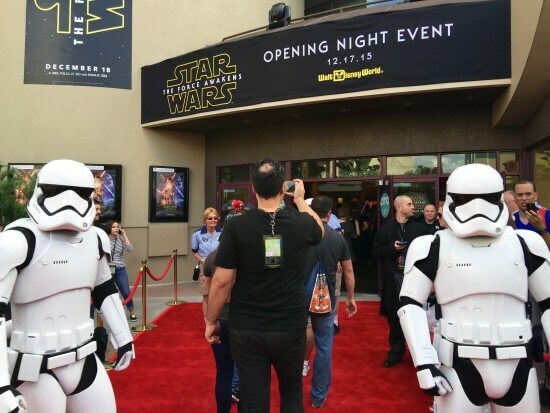 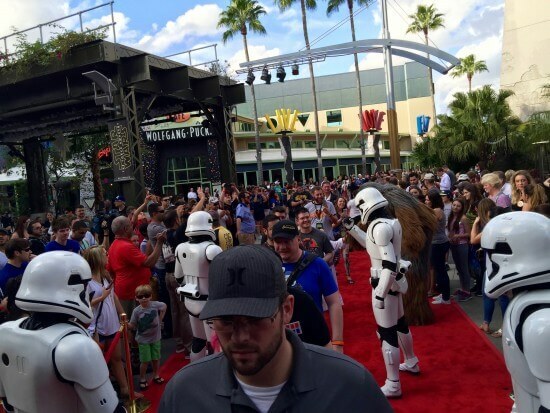 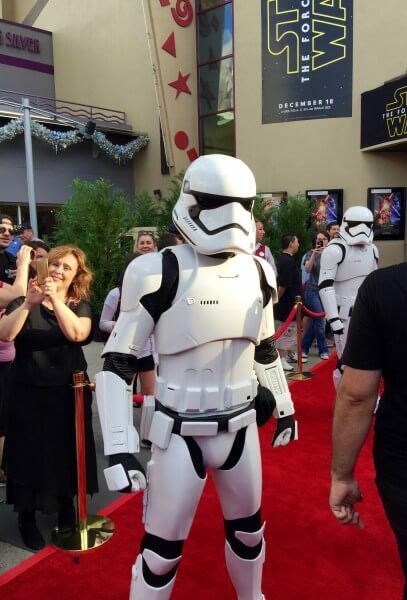 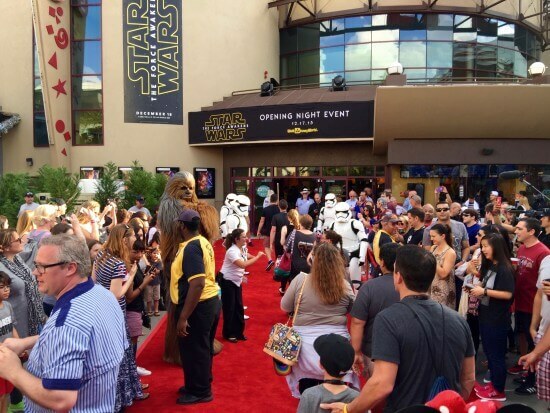 A special red carpet area was constructed at the entrance with Stormtroopers, assorted droids and Chewbacca himself greeting guests while entering the theater. 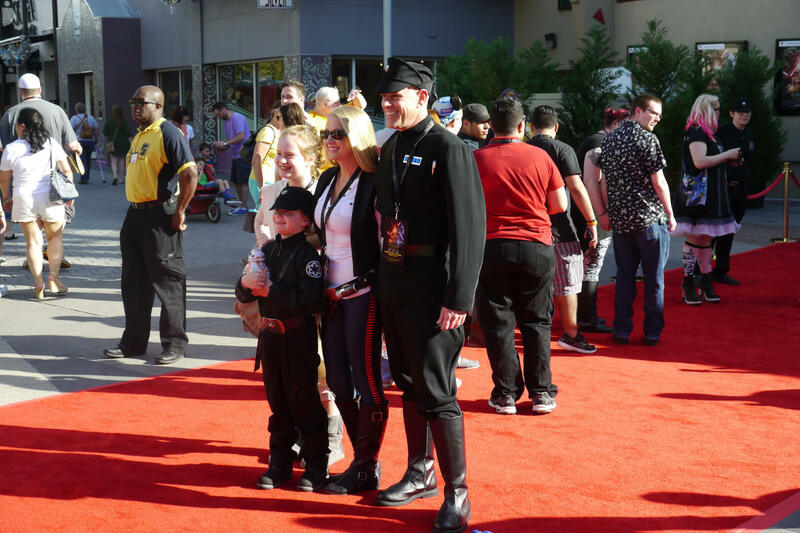 The event was planned and coordinated very well with little fuss, though there was nothing to do for almost three hours as guests simply sat in their respective theaters waiting for the movie to screen. 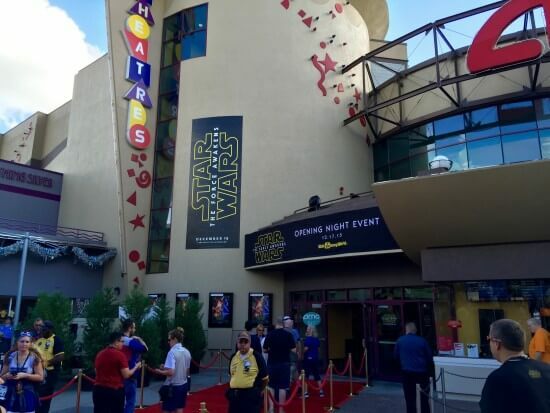 Scenes from the prior movies, episodes of “Star Wars Rebels” or a continuous loop of the trailers playing would have been a nice touch instead of a blank screen, though there was a neat intro made by Disney just before the movie began that explained what awaited guests at Hollywood Studios afterwards. 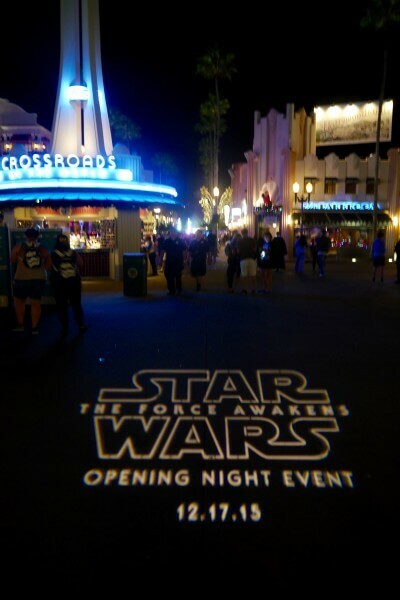 After the movie ended, guests entering the park were greeted with a complimentary BB-8 glow lanyard as the distant sounds of a DJ dance party came from the park’s central hub in front of the replica of Grauman’s Chinese Theatre. First Order Stormtroopers patrolled the area in front of Launch Bay as well as near the dance party, where they would assist with the intro to the new “Symphony in the Stars: A Galactic Spectacular” fireworks show that began at 12:45am with a special one-time only appearance by Captain Phasma. 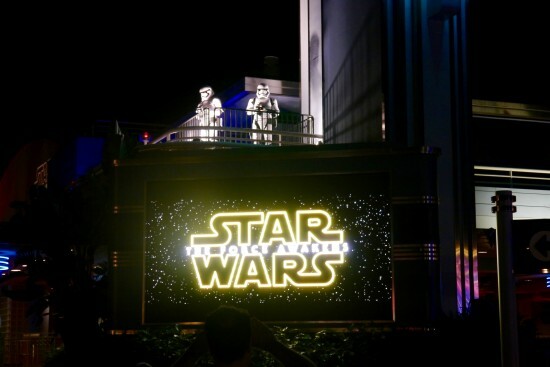 A unique “Star Wars” version of the Rock “n” Roller Coaster also made its debut just for the special event, with John Williams music replacing Aerosmith during the ride. 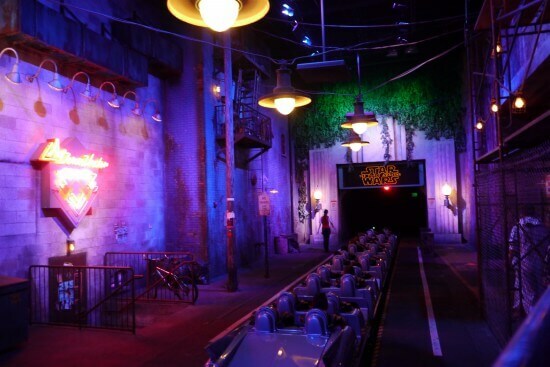 Though the entire Hollywood Studios was not open to guests, several attractions including Star Tours, Jedi Training: Trials of the Temple and Tower of Terror were open and featured zero wait time due to the relatively small amount of guests. 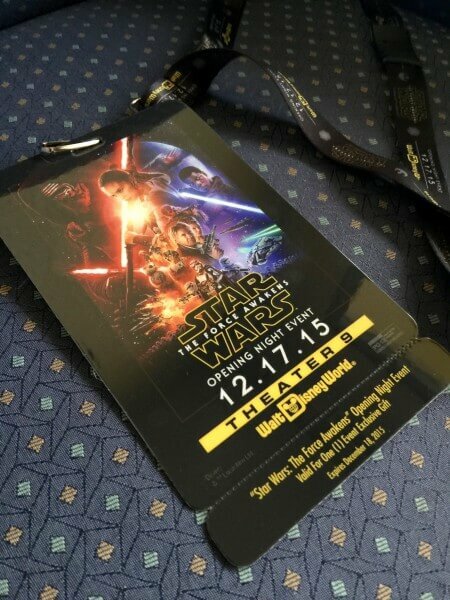 Adults were unfortunately not allowed to participate during the Jedi Training even though three shows were held with the last one at 1:25am. 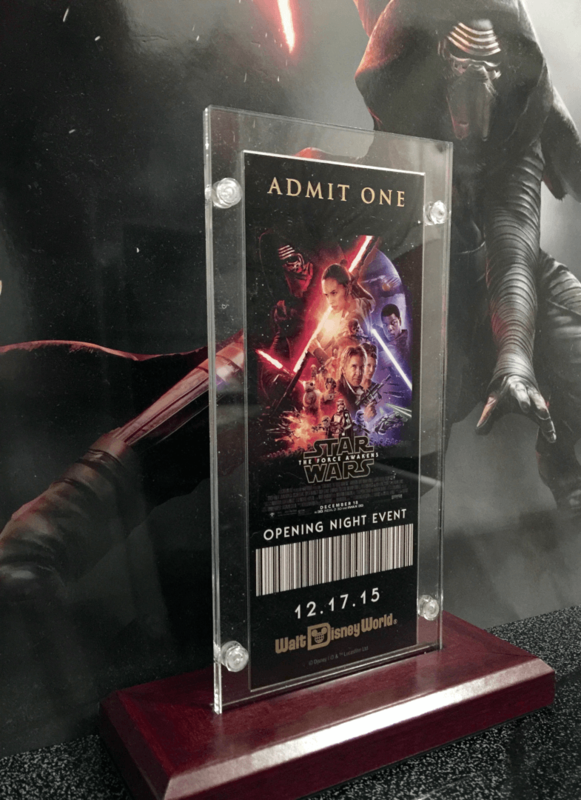 Gift distribution areas were set up for guests to pick up their souvenir ticket for the event which even came with a wooden base to prop it up. 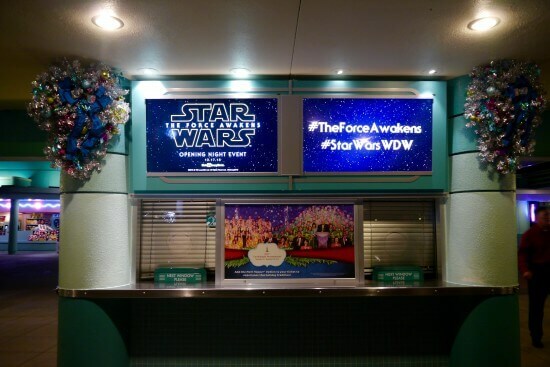 Another great addition was the ability to freely access and download all the PhotoPass images taken at various Star Wars scenes throughout the park as well as at the Rock ‘n’ Roller Coaster and Tower of Terror attractions. Overall, it was a well-conceived nod to faithful Star Wars fans and a fantastic way to celebrate the release of “The Force Awakens”. 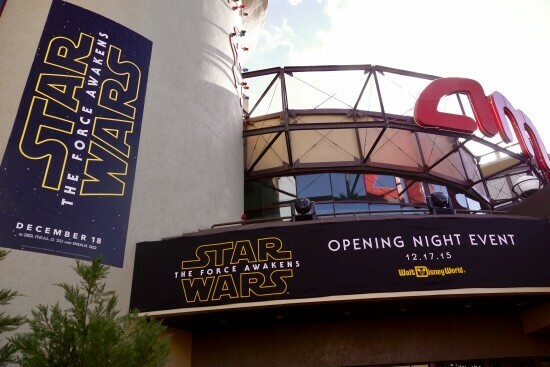 Looks like a great night, by the time we decided to bite the bullet and go it was sold out. 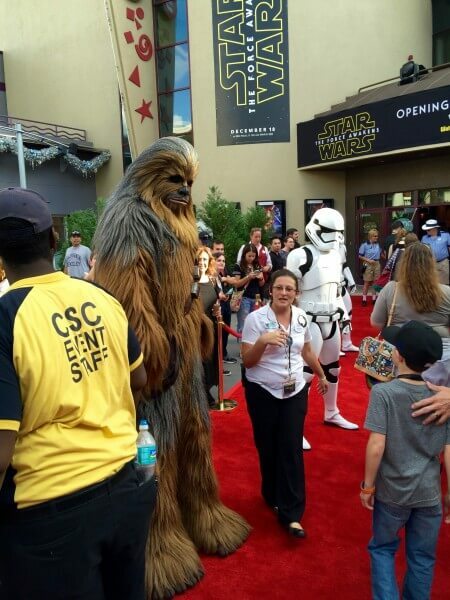 Surprised they didn’t have assigned seating, that made our night at The Fork and Screen a breeze.